The Spanish painter, sculptor, and graphic artist Pablo Picasso was one of the most productive and revolutionary artists in the history of Western painting. As the central figure in developing cubism (an artistic style where recognizable objects are fragmented to show all sides of an object at the same time), he established the basis for abstract art (art having little or no pictorial representation). Pablo Ruiz Picasso was born on October 25, 1881, in Malaga, Spain. He was the eldest and only son with two younger sisters, Lola and Concepción. His father, José Ruiz Blasco, was a professor in the School of Arts and Crafts. Pablo's mother was Maria Ruiz Picasso (the artist used her surname from about 1901 on). It is rumored that Picasso learned to draw before he could speak. As a child, his father frequently took him to bullfights, and one of his earlier paintings was a scene from a bullfight. In 1891 the family moved to La Coruña, where, at the age of fourteen, Picasso began studying at the School of Fine Art. Under the academic instruction of his father, he developed his artistic talent at an extraordinary rate. When the family moved to Barcelona, Spain, in 1896, Picasso easily gained entrance to the School of Fine Arts. A year later he was admitted as an advanced student at the Royal Academy of San Fernando in Madrid, Spain. He demonstrated his remarkable ability by completing in one day an entrance examination for which an entire month was permitted. Picasso soon found the atmosphere at the academy stifling, and he returned to Barcelona, where he began to study historical and contemporary art on his own. At that time Barcelona was the most vital cultural center in Spain, and Picasso quickly joined the group of poets, painters, and writers who gathered at the famous café Els Quatre Gats (The Four Cats). Between 1900 and 1903 Picasso stayed alternately in Paris, France, and Barcelona. He had his first one-man exhibition in Paris in 1901. At the turn of the twentieth century Paris was the center of the international art world. In painting it was the birthplace of the impressionists—painters who depicted the appearance of objects by means of dabs or strokes of unmixed colors in order to create the look of actual reflected light. While their works retained certain links with the visible world, they exhibited a decided tendency toward flatness and abstraction. Picasso set up a permanent studio in Paris in 1904. His studio soon became a gathering place for the city's most modern artists, writers, and patrons. Picasso's early work reveals a creative pattern which continued throughout his long career. Between 1900 and 1906 he worked through nearly every major style of contemporary (modern) painting. In doing so, his own work changed with extraordinary quickness. The years between 1901 and 1904 were known as Picasso's Blue Period. Nearly all of his works were executed in somber shades of blue and contained lean, melancholy, and introspective (concentrating on their own thoughts) figures. Two outstanding examples of this period are the Old Guitarist (1903) and Life (1903). In the second half of 1904 Picasso's style took a new direction. In these paintings the color became more natural, delicate, and tender in its range, with reddish and pink tones dominating the works. Thus this period was called his Pink Period. The most celebrated example of this phase is the Family of Saltimbanques (1905). Picasso's work between 1900 and 1905 was generally flat, emphasizing the two-dimensional character of the painting surface. Late in 1905, however, he became increasingly interested in pictorial volume. This interest seems to have been influenced by the late paintings of Paul Cézanne (1839–1906). The face in Portrait of Gertrude Stein (1906) reveals still another new interest: its mask-like abstraction was inspired by Iberian sculpture, an exhibition of which Picasso had seen at the Louvre, in Paris, in the spring of 1906. This influence reached its fullest expression a year later in one of the most revolutionary pictures of Picasso's entire career, Les Demoiselles d'Avignon (1907). Les Demoiselles d'Avignon is generally regarded as the first cubist painting. The faces of the figures are seen from both front and profile positions at the same time. Between 1907 and 1911 Picasso continued to break apart the visible world into increasingly small facets of monochromatic (using one color) planes of space. In doing so, his works became more and more abstract. Representation gradually vanished from his painting, until it became an end in itself—for the first time in the history of Western art. The growth of this process is evident in all of Picasso's work between 1907 and 1911. Some of the most outstanding pictorial examples of the development are Fruit Dish (1909), Portrait of Ambroise Vollard (1910), and Ma Jolie, also known as Woman with a Guitar (1911–12). About 1911 Picasso and Georges Braque (1882–1963) began to introduce letters and scraps of newspapers into their cubist paintings, thus creating an entirely new medium, the cubist collage. Picasso's first, and probably his most celebrated, collage is Still Life with Chair Caning (1911–1912). After Picasso experimented with the new medium of collage, he returned more intensively to painting. In his Three Musicians (1921), the planes became broader, more simplified, and more colorful. In its richness of feeling and balance of formal elements, the Three Musicians represents a classical expression of cubism. Picasso also created sculpture and prints throughout his long career, and made numerous important contributions to both media. 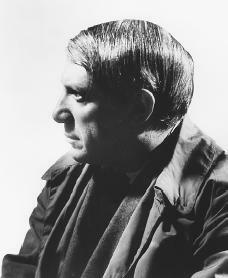 He periodically worked in ceramics, and designed sets, curtains, and interiors for the theater. In painting, even the development of cubism fails to define Picasso's genius. About 1915, and again in the early 1920s, he turned away from abstraction and produced drawings and paintings in a realistic and serenely beautiful classical style. One of the most famous of these works is the Woman in White (1923). Painted just two years after the Three Musicians, the quiet and unobtrusive (not calling attention to itself) elegance of this masterpiece testifies to the ease with which Picasso could express himself pictorially. One of Picasso's most celebrated paintings of the 1930s is Guernica (1937). This work had been commissioned for the Spanish Government Building at the Paris World's Fair. It depicts the destruction by bombing of the town of Guernica during the Spanish Civil War (1936–39; the military revolt against the Spanish government). The artist's deep feelings about the work, and about the massacre (a mass killing) which inspired it, are reflected in the fact that he completed the work, that is more than 25 feet wide and 11 feet high, within six or seven weeks. Guernica is an extraordinary monument within the history of modern art. Executed entirely in black, white, and gray, it projects an image of pain, suffering, and brutality that has few parallels. Picasso applied the pictorial language of cubism to a subject that springs directly from social and political awareness. Picasso also declared publicly in 1947 that he was a Communist (someone who believes the national government should control all businesses and the distribution of goods). When he was asked why he was a Communist, he stated, "When I was a boy in Spain, I was very poor and aware of how poor people had to live. I learned that the Communists were for the poor people. That was enough to know. So I became for the Communists." But sometimes the Communist cause was not as keen on Picasso as Picasso was about being a Communist. A 1953 portrait he painted of Joseph Stalin (1879–1953) caused an uproar in the Communist Party's leadership. The Soviet government banished his works. Although Picasso had been in exile from his native Spain since the 1939 victory of Generalissimo Francisco Franco (1892–1975), he gave eight hundred to nine hundred of his earliest works to the city and people of Barcelona. To display these works, the Palacio Aguilar was renamed the Picasso Museum and the works were moved inside. But because of Franco's dislike for Picasso, Picasso's name never appeared on the museum. Picasso was married twice, first to dancer Olga Khoklova and then to Jacqueline Roque. He had four children. He was planning an exhibit of over two hundred of his works at the Avignon Arts Festival in France when he died at his thirty-five-room hilltop villa of Notre Dame de Vie in Mougins, France, on April 8, 1973. The discovery of cubism represents Picasso's most important achievement in the history of twentieth-century art. Throughout his life he exhibited a remarkable genius for sculpture, graphics, and ceramics, as well as painting. His is one of the most celebrated artists of the modern period. Cowling, Elizabeth. Interpreting Matisse, Picasso. Harry N. Abrams, 2002. Léal, Brigitte, Christine Piot, and Marie-Laure Bernadac. The Ultimate Picasso. Edited by Molly Stevens and Marjolijn de Jager. New York: Harry N. Abrams, 2000. Olivier, Fernande. Picasso and His Friends. New York: Appleton-Century, 1965. Richardson, John. A Life of Picasso. New York: Random House, 1991. What was pablo's favorite sport?Can anyone help my son with this question..
How did pablo picasso create a group of dancers?was it with paint? can anyone help me answer this?